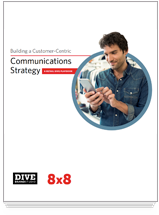 Building a Customer-Centric Communications Strategy | 8x8, Inc. In today’s digital-first landscape, retailers are interacting with customers more than ever. While reaching consumers through a multitude of channels has its benefits, brands often struggle to communicate one unified message that aligns with its customer-centric approach. In this playbook, you’ll learn how to streamline internal communication and collaboration to improve both the customer and the employee experience through cloud-based communication systems. Read the Playbook: Building a Customer-Centric Communications Strategy now. Click the button below to Download the Playbook.